Don't worry about glueing and mounting your new tubulars. We will do it fast and right. We can also get your bike tuned and ready for the mud. We have a couple go-tos that we recommend for great all around performance in varying conditions. This is the everyman's cross tire, and a favorite at the shop. It is a durable, light, supple riding all-around tire, and it's also versatile, performing well at varying terrain and pressure. This is the choice for those of us who don't have a truck full of tire choices at our disposal. And best of all, it is friendly to the wallet. These are a favorite, aggressive mud specialist. Available in clincher and tubular, the PDX has aggressive, 2cm knobs spaced far apart for superior mud clearance. A true mud tire, it also rolls fast at higher pressures. They are precisely straight, which helps mounting and rolling. 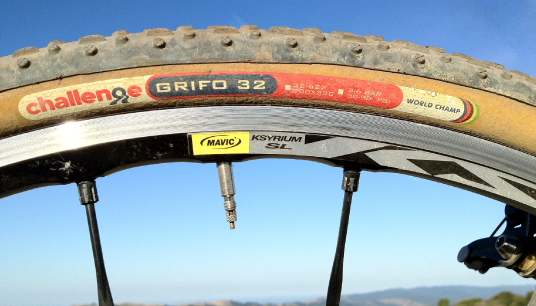 The tires, especially the sidewalls, are super durable, and will battle punctures all season. A tire that's been around longer than many of us, this is a classic. It is a really good all-round cyclo-cross tyre, versatile enough to cope with a range of conditions from hardpack to muddy fields. With a low-profile triangular tread, it strikes the right balance of grip and speed. .
Come in and see what our people think of these, and let them guide you to the right rubber.